I am so very excited to bring you the latest information on Stephanie Dray's next novel in her Cleopatra's Daughter Trilogy! 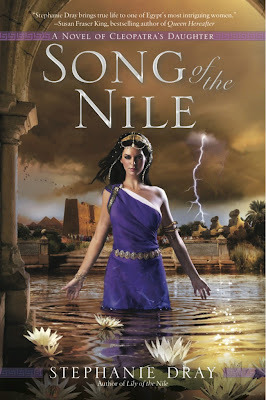 Her previous book, Lily of the Nile (my review), was fabulous and I am eager to read this upcoming release. Song of the Nile should be released sometime this Autumn, but the exact publish date is yet to be announced; I will update you as soon as I find out any more information. But it’s the magic of Isis flowing through her veins that makes her indispensable to the emperor. Against a backdrop of imperial politics and religious persecution, Cleopatra’s daughter beguiles her way to the very precipice of power. She has never forgotten her birthright, but will the price of her mother’s throne be more than she’s willing to pay?"